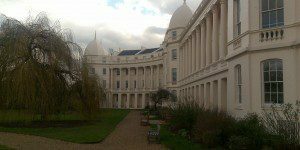 The London Business School, as it is now known, was founded in 1964 as the London Graduate School of Business Studies by the British National Economic Development Council in response to the success and popularity of business schools in the U.S.A. Upon its opening in 1966, the school was located temporarily on Northumberland Avenue, near the House of Parliament on the Thames. It wasn’t until 1970 that the school’s current Regent’s Park Campus was opened by Queen Elizabeth II. The London Business School has always made student opportunities a priority, and several exclusive fellowships and partnerships with other elite institutions ensure that students at LBS have ample options for networking and advanced scholarship. More recently in 2009, LBS expanded its global reach by establishing an EMBA-Global Asia program in partnership with Hong Kong University and Columbia University. The school has the distinct honor of triple accreditation by EQUIS, AACSB, and the Association of MBAs. With a campus that abuts the beautiful, 395-acre Regent’s Park, central London’s largest open green space, LBS offers its students clean air and open space while remaining in the heart of bustling Central London. Buildings like the Sainsbury, one of LBS’s main structures, house all of the expected services in unexpectedly ornate and elegant architecture that gives LBS a timeless air. Although the façades may suggest antiquity, LBS has stayed up-to-date technologically and continues to add to their campus facilities, notably signing a contract with Westminster City Council that will give the School the use of Old Marylebone Town Hall. The school is easily accessible due to London’s extensive public transportation system. The city’s Heathrow, Gatwick, and City airports can all be reached within less than an hour via train. Facilities include the Sainsbury Building and the Plowden Building, which, between the two, contain 12 lecture halls, 100 seminar rooms, 10 function rooms, and six flat-floor teaching rooms. In 2017, opened the brand new Sammy Ofer Centre, which will house three stories worth of advanced teaching facilities, six lecture theatres, a student lounge, 35 seminar rooms, a library, offices, staff and faculty suites, broadcast facilities and a new alumni centre. The building will be located in the Old Marylebone Town Hall. The faculty is made up of close to 150 members, and over 30 nationalities with an age range of 29 to 73. 26 percent of current faculty identify as female. Similarly diverse, the student body of LBS consists of around 2,000 students per year. The London Business School offers a traditional full-time MBA, an Executive MBA (taught in London and Dubai), a Global Executive MBA through Columbia University in the U.S. and The University of Hong Kong, and several Masters programs.